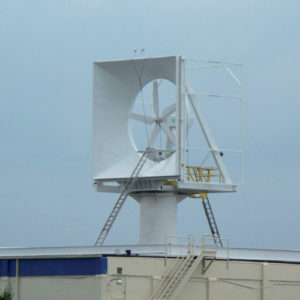 This section introduces the horizontal-axis wind turbine (HAWT), which is by far the most common type of wind turbine. Horizontal-axis wind turbines may produce less than 100 kW for basic applications and residential use, or as much as 6 MW for offshore power generation. Even larger turbines are on the drawing board. The horizontal-axis wind turbine (HAWT) is a wind turbine in which the main rotor shaft is pointed in the direction of the wind to extract power. The principal components of a basic HAWT are shown in Figure 1. The rotor receives energy from the wind and produces a torque on a low-speed shaft. The low-speed shaft transfers the energy to a gearbox, high-speed shaft, and generator, which are enclosed in the nacelle for protection. Notice how the blades are connected to the rotor and to the shaft. This shaft is called the low-speed shaft because the wind turns the rotating assembly at a leisurely 10 to 20 revolutions per minute (rpm) typically. The low-speed shaft connects to the gearbox, which has a set of gears that increase the output speed of the shaft to approximately 1,800 rpm for an output frequency of 60 Hz (or a speed of 1,500 rpm if the frequency is 50 Hz). For this reason, the shaft from the gearbox is called the high-speed shaft. The high-speed shaft is then connected to the generator, which converts the rotational motion to AC voltage. This speed is critical if it is used to turn the generator directly because the frequency of the ac from the generator is related directly to the rate at which it is turned. Almost all horizontal-axis wind turbines have similar components to those discussed in this article, but there are some exceptions. 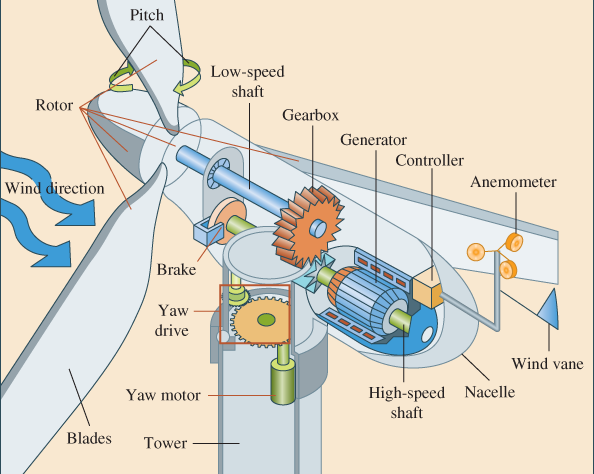 For example, direct-drive wind turbines do not have a gearbox, and they usually have a DC generator rather than an AC generator. These may or may not include a converter to AC (which can be located at the tower base). In commercial turbines, a computer or programmable logic controller (PLC) is the controller. The controller takes data from an anemometer to determine the direction the wind turbine should be pointed, how to optimize the energy harvested, or how to prevent over-speeding in the event of high winds. Controlling the output frequency and keeping it constant despite varying winds can be done in one of three ways. One way is to control the speed at which the generator shaft turns, which can be accomplished by adjusting the pitch and yaw. Pitch is the rotational angle of the blades on a wind turbine; yaw is the direction the wind turbine blades and nacelle are facing. Pitch and yaw can be adjusted so that a high-speed shaft runs at a constant rate to produce the required output frequency (typically 50 Hz or 60 Hz) from the generator. HAWTs may also use a gearbox or set of gears, which changes the slow rotation of the blades into a faster rotation for the generator. The optimum blade rotation is generally between 10 and 20 rpm, and the gear ratio can be used to make the high-speed shaft rotate at the speed the generator requires. The second method for controlling the frequency is to allow the turbine to run freely at any speed that is within its ratings and send the voltage to a power electronic frequency converter. This method is also used with vertical-axis wind turbines (VAWTs). When a frequency converter is used, the rotational speed of the turbine is not controlled until the maximum speed is reached, at which point speed controls take over. The frequency converter consists of the features shown in Figure 2. The inverter accepts single-phase or three-phase AC to its input circuits within a specified range of frequency and voltage level. The AC is filtered and converted to DC by the rectifier and smoothed with passive filters to remove any trace of the input frequency. 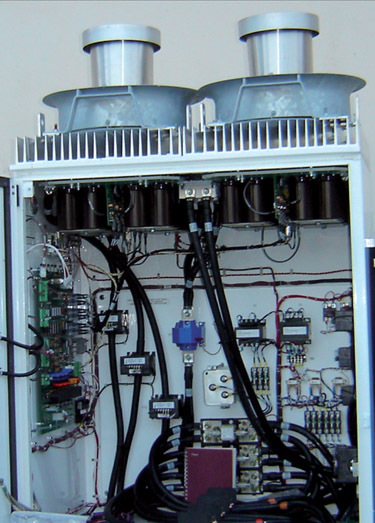 The next section has an inverter that converts the DC voltage back to single-phase or three-phase AC voltage at the precise frequency and phase required by the grid. This method has the advantage of having a wider range of operating conditions without requiring more complicated gearing. A few applications can use pure DC, which can be obtained from a point before the inverter. 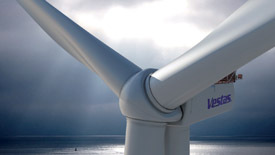 Vestas has plans for the world’s largest wind turbine. The blades for this wind turbine will be 164 meters (538 feet) in diameter and will have a rated capacity of 8 megawatts. The new wind turbine will be an offshore wind turbine located near Aberdeen Bay in Scotland. The internal parts for a commercial power electronic frequency converter are shown in Figure 4. The third way to control the output frequency of the generator is to use a double-feed, inductive-type generator in which the AC field current is tightly controlled to the required output frequency by feeding the current through an electronic circuit that produces an exact frequency. The tower for a Horizontal-Axis Wind Turbine maybe 40 to 100 m (approximately 130 to 328 ft) high so that it is tall enough to position the turbine blade into the strongest wind flow. Most sites have the strongest winds well above ground level. Today, most towers for larger wind turbines used to produce electrical power for utilities are in the range of 65 to 100 m tall. The Encore E126, recently installed in Germany, has a tower that is 138 m (453 ft) high. The blades are located on the main shaft, on a rotor at a considerable distance in front of the tower, so they are far enough out to clear the tower when the blades are rotating. The blade pitch and the direction the turbine faces have already been described as functions monitored by the controller. The controller also uses sensors to measure the generator output (voltage and frequency), turbine blade speed, vibration, turbine and drive train parameters, and other parameters such as a number of complete rotations of the vertical axis (yaw control). Some systems limit the number of full rotations made by the turbine yaw in one direction before reversing directions. The data from these sensors is usually stored for operators to review as necessary. 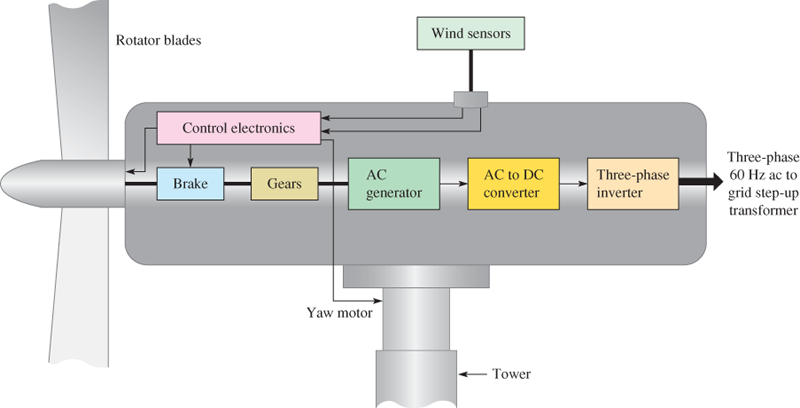 Figure 5 shows all the parts in the horizontal-axis wind turbine (HAWT). Horizontal-Axis Wind Turbines may be designed with one, two, three, or more blades. The fewer blades a wind turbine has, the faster the blades must turn to harvest the same amount of energy as a wind turbine with more blades. For example, a three-blade wind turbine does not have to turn as fast as a two-blade wind turbine to harvest the same amount of energy. Therefore, the tip speed ratios of a two-blade wind turbine and a three-blade wind turbine are different. Smaller, residential-size units are designed for cost efficiency and the size of the electrical load of the home. Turbines used for commercial production of electric power may be two-blade, three-blade or five-blade, all of which are designed for much larger energy loads. The vast majority of horizontal-axis wind turbines used in the commercial production of power for utility companies are three-blade turbines. Single-blade wind turbines are used in a few limited applications, but they are the least used of all the Horizontal-Axis Wind Turbines. To rotate smoothly, single-blade turbines must have one or two counterbalances. Figure 6 shows a single-blade wind turbine with two counterbalances. The advantage of this type of wind turbine is the lower cost because of the use of only one turbine blade (and the small weight savings), but single-blade turbines must run at much higher speeds to convert the same amount of energy from the wind as two-blade or three-blade turbines with the same size blades. Because the single-blade turbine must run at higher speeds, more wear and fatigue are generated on the blade and bearings in the mounting mechanism, which in turn means higher maintenance costs over the life of the turbine. Single-blade turbines also require extensive setup procedures to ensure that the blade is mounted perfectly and is balanced to limit oscillation and vibration. Because of these problems, very few single-blade turbines are in use today. 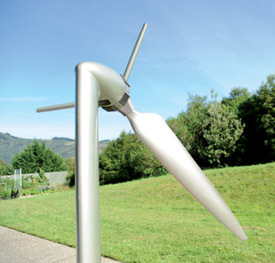 Figure 6 Single-Blade Horizontal-Axis Wind Turbine with Two Counterbalances. Compared to three-blade turbines, two-blade wind turbines have the advantage of saving on the cost and the weight of the third rotor blade, but they have the disadvantage of requiring higher rotational speed to yield the same energy output. This is a disadvantage in terms of both noise and wear of critical bearings, shafts, and gearboxes. Two-blade turbines have experienced high-fatigue failures of the blade and other mechanical parts, so they have limited application. Figure 7 shows a two-blade wind turbine. Another way to improve the efficiency of the two-blade turbine is to make the two blades thicker and wider than traditional turbine blades so that the two blades can convert more wind energy. The thicker blades also mean that the blades are stronger and better able to resist fatigue problems. New composite materials allow the increased size without adding substantial weight to each blade. These materials also allow the blade to be produced at a lower cost. Even with these more efficient blades, however, the two-blade turbine is still slightly less efficient than the three-blade turbine. One advantage to a two-blade turbine is that it is faster and safer to install than the three-blade version. The two-blade turbine can be lifted into position after the turbine blades have been mounted while it is still on the ground because the blades can be mounted in a horizontal position and easily lifted as a unit. A three-blade turbine always has one blade pointing downward if it is raised as a unit, so it is more difficult to get the larger wind turbines off the ground as a unit for mounting. The majority of large horizontal-axis wind turbines use three blades, with the rotor position maintained upwind by the yaw control. Figure 8 shows a three-blade wind turbine. The three blades provide the most energy conversion while limiting noise and vibration. The three blades provide more blade surface for converting wind energy into electrical energy than a two-blade or single-blade wind turbine. The blades for the larger horizontal-axis wind turbines are so large they must be transported individually by a truck and trailer. This also means that one or more very large cranes are needed to set the tower and turbine in place. 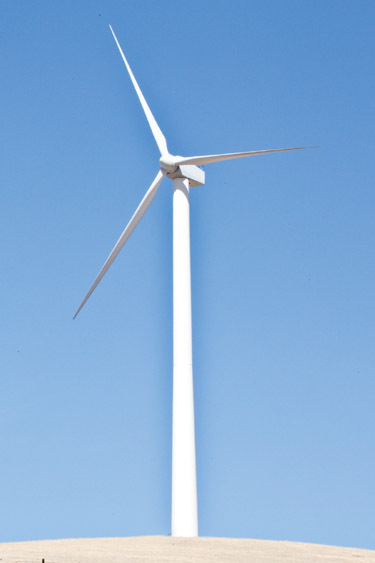 The tower to hold the larger three-blade turbine must also be larger and reinforced to support the weight and to withstand the increased wind power that is harvested to produce its maximum output. The blades on larger three-blade wind turbines are typically installed one at a time after the nacelle is mounted on the tower. On smaller three-blade turbines, the blades can be mounted to the rotor while the rotor is on the ground. Then the entire rotor assembly is lifted with a crane and attached to the shaft after the nacelle is mounted on the tower. A few wind turbines have five blades to produce electrical energy efficiently from low-speed winds. Figure 9 shows a five-blade wind turbine. A five-blade wind generator normally has narrower and thinner blades, which creates issues with strength. While they are excellent in low-speed winds, they become inefficient in high-speed winds and they are noisier. The tower and base are mounted into the roof of the building, which is a concrete-reinforced building. 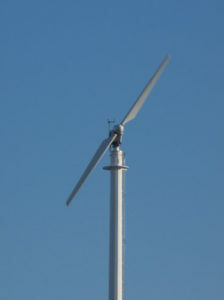 This type of five-blade wind turbine needs a very strong base and tower to hold the wind turbine in the wind. Notice the thickness of the tower and the cowling around the blades, which helps direct wind directly into the blades. Wind turbine blades can be compared in a number of ways, such as by size, weight, material, and the way they are manufactured. Wind turbine blades can be made from a variety of materials, from wood for smaller blades to aluminum and other metals for small and medium-size blades. Turbine blades must be stiff enough to prevent the blade tips from being pushed into the tower by high winds, yet agile enough to convert wind power into electricity efficiently. The largest commercial wind turbine blades are made of composite materials (carbon composition, plastics, and fiberglass), which makes them lighter in weight yet strong enough to hold up in high winds. The core may be filled with plastic foam or other lightweight substance to add rigidity. A typical fiberglass blade for a 100-kW wind turbine is 9 m (30 ft) long; a typical blade for a 2-megawatt wind turbine is 45 m long. Blade Dynamics is a wind turbine developer in the UK that is developing a blade that will measure between 80 and 100 m long! The blade will be made from carbon fiber and assembled from smaller pieces. It will be used for future turbines in the 8-10 MW range. Table 1 summarizes the advantages and disadvantages of single-, two-, and three-blade wind turbines. What are the major parts of a horizontal-axis wind turbine? If a one-blade rotor and a two-blade rotor of the same diameter are producing the same power with a certain wind speed, will there be a difference in noise level? Explain. What do you think is the primary reason that three-blade rotors are more widely used than other types? Why does a single-blade wind turbine need one or more counterbalances? Identify three ways a wind turbine can provide a voltage at the correct frequency for the grid. Yes. Because they are both producing the same power, the one-blade rotor is turning twice as fast as the two-blade rotor and is therefore noisier. Three-blade turbines produce more energy for their investment than other types. Three ways are (1) control the speed of the turbine using pitch and yaw control, (2) allow the turbine to free run and control the output frequency with an electronic converter system, and (3) use a double-feed inductive-type generator in which the ac field current is tightly controlled.